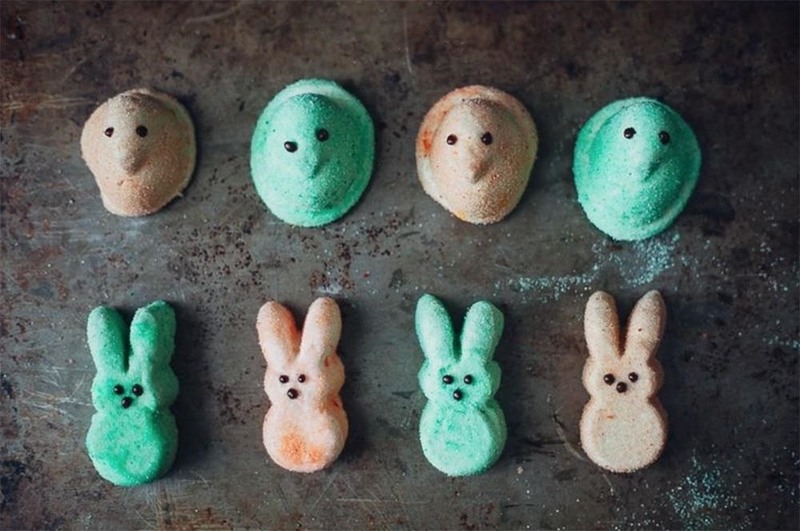 Make delicious candy for Easter from the comfort of your kitchen with copycat versions of your favorite classics: Marshmallow Peeps, Cadbury Creme Eggs, Reese's Peanut Butter eggs, Almond Joy bars, and chocolate bunnies. The best part is that you get your sugar fix without the preservatives. The thought of making marshmallows can seem intimidating, but once you do it from scratch, you won't ever go back to store-bought. Molly over at Food52 shares her recipe for this holiday favorite. Try making custom flavors such as lemon, raspberry, or vanilla for an elevated spin on a kid classic. Don't worry about searching for precious Cadbury eggs at the store—they are easy to make, and taste just like the real thing. The creamy center is created using an enzyme called invertase. The protein breaks up table sugar, which is actually made of glucose and fructose bound together, into its individual components, which are liquid at room temperature. This runny mix is often called inverted sugar syrup. Invertase isn't sold at most groceries stores, so I suggest visiting a local candy or baking supply store. You also have the option of ordering online to save yourself the hassle of searching. I tried this copycat recipe from Baking Beauty and made my own eggs with ease. Combine corn syrup, butter, and vanilla in a large mixing bowl. Add invertase and give the filling a final mix. Spoon out a third of the filling and place it in a smaller bowl; then add a few drops of yellow food coloring to make the yolk. Refrigerate both the yellow and white fillings for at least 30 minutes. Take the yellow filling and roll it into small one inch balls, then place them on a wax lined baking sheet. Remove the white filling from the refrigerator, wrap it around the yellow balls and form egg shapes. Place the eggs in the fridge or freezer until they are frozen solid. Remove the 'eggs' from the freezer, then dip them in chocolate one by one using a fork. 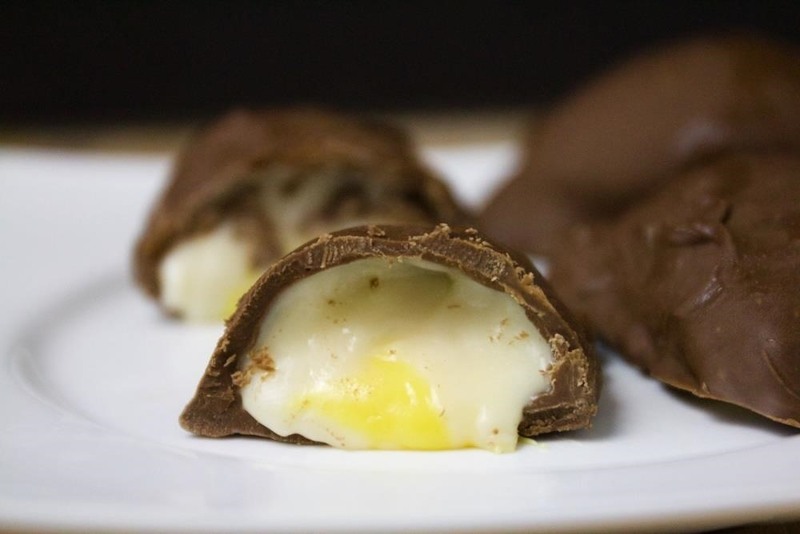 Return the chocolate-covered eggs to the wax paper and allow the chocolate to harden in the fridge. Note: It takes a couple days for the invertase to work its magic and turn the centers into liquid, so be patient. The final product is definitely worth the wait (as you can see below). It's not Easter without peanut butter eggs ... or at least, that's how I see it. This recipe from Hot Chocolate Hits is spot on! I recommend mixing graham cracker crumbs with peanut butter to give your eggs a nice, crumbly texture. 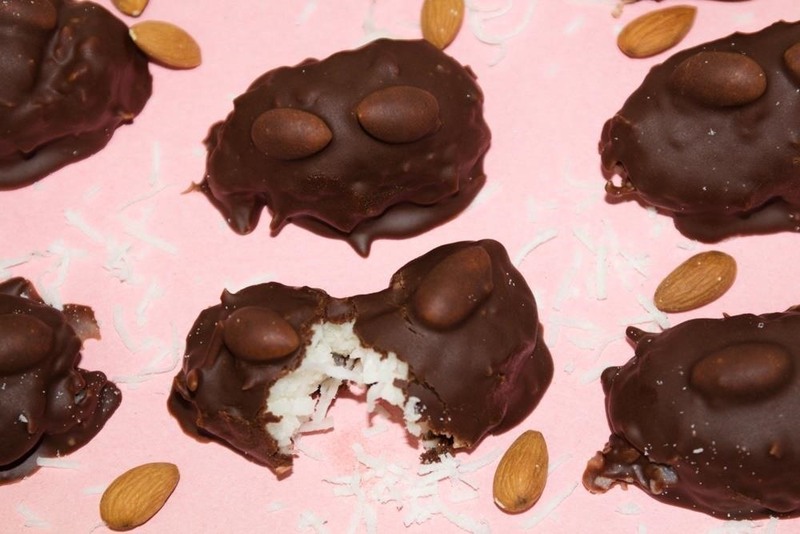 I know Almond Joy is always in-season, but I have a lot of fond childhood memories of getting this candy bar in my basket — so that's how it earned its way onto this list. The simple mix of chocolate with sweet coconut flakes and crunchy almonds makes this treat irresistible. Mom On Timeout has a foolproof recipe that I encourage you to try; I've listed it below (with my alterations). Combine coconut flakes, powdered sugar, butter, and corn syrup in a large bowl and mix well. Line a baking sheet with wax paper, then shape bars with the coconut mixture. Press 2 almonds onto the top of each bar. Refrigerate the coconut bars for anywhere between 30 minutes to an hour, or until the mixture has hardened enough to not fall apart when picked up. Melt your chocolate in a microwave save bowl in 30-second increments until mostly melted, then stir to melt the rest of the chips that still hold shape. Individually drop coconut bars in the chocolate, cover, and use a fork to remove the coated bars from the chocolate. Repeat this process until you are finished and place the candy bars back on the baking sheet to harden. Pro tip: For a "healthier" version, use coconut oil instead of corn syrup and butter. Swap out the sweetened coconut flakes for unsweetened to cut back on sugar. No basket is complete without a few chocolate rabbits. 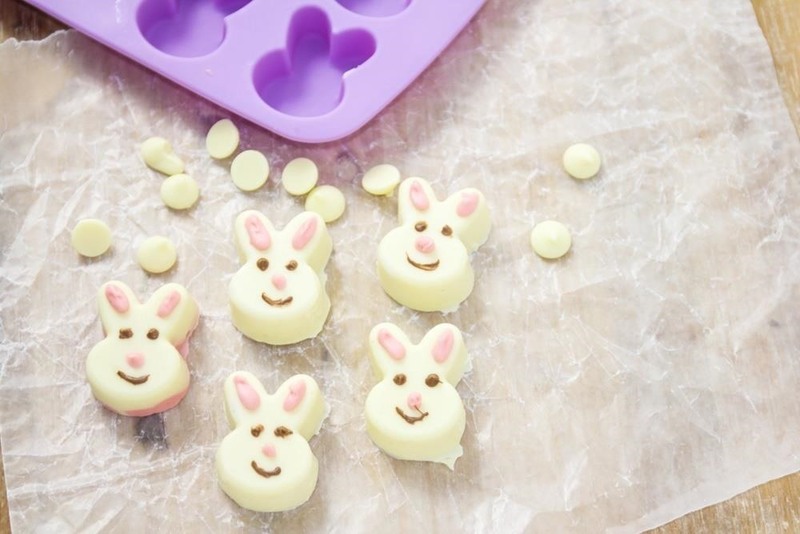 If you're a much of a fan of Easter candy as I am, I think it's worth buying a traditional rabbit mold to use year after year. 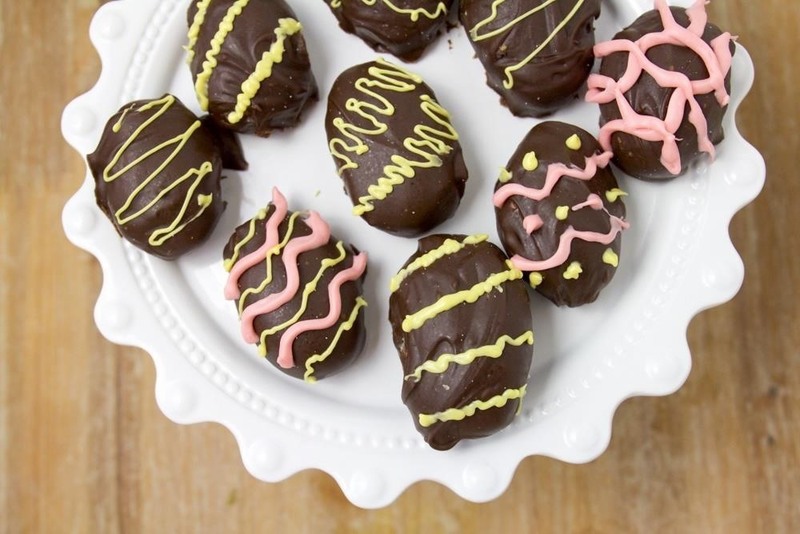 The next time you are at the grocery store, skip the seasonal displays and "hop" on over to the baking aisle to stock up on chocolate and easy ingredients — and make your own Easter candy at home. Do you have any copycat candy recipes you use for Easter? Share your favorites in the comments below.